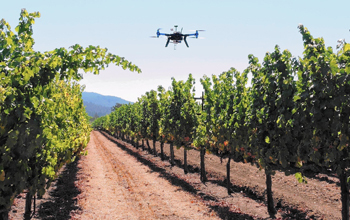 Agriculture: Drones / UAVs can be custom-built for efficient and fast crop mapping and spraying systems for use in the agricultural industry. Our turnkey offerings are focused on establishing a full-time drone solution in your organisation. We can teach your team to fly purpose-built drones that have been designed for application in the agricultural industry. Operating at fast speeds and an aerial vantage point, drones can cover hundreds of hectares of land, collecting diverse and detailed data, in a single flight. This will allow you to map large crop areas, identify problems, optimise outputs, maximise production, and estimate returns. Bringing a drone solution to bear on your agricultural projects is an accurate, comprehensive and cost-effective decision sure to have a positive impact on your organisation’s productivity and success. UAVs have the ability to accurately monitor crop progress and determine whether a crop is healthy or not, whatever its size. Monitoring a crop’s progress has never been easier than with the time lapse and recording capabilities of a UAV which can show inefficiencies and can help to suggest better crop management strategies. Agricultural UAVs can produce 3D maps for analysing gathered data, determining moisture content, and monitoring nitrogen levels – important factors when it comes to seed planting and land development projects. When it comes to irrigation, UAV data can help to highlight areas in need of better irrigation, as well as track plant progress over time. 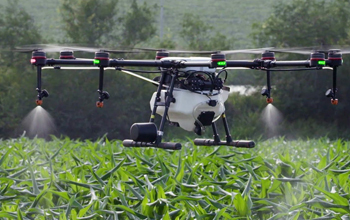 UAVs offer a new way to spray your crops. With virtually no damage to the surrounding terrain, a UAV can cover large tracts of land no matter how uneven or challenging. This makes them the perfect precision spraying tool. Combined with mapping and data collection, you can use your UAV to cover specific areas, increasing your efficiency.